The New Hampshire State Legislature recently passed an amendment to the state budget that required that the state library “review the federal program guidelines for which it receives federal dollars to support library programs and seek to amend its 5-year plan to use the funding that has been designated to support 3 of the interlibrary vans for other purposes”. We are strongly opposed to reducing the funding for the library vans, which are used to support the Inter Library Loan (ILL) program, for the following reasons. No service of the State Library has as much impact on our patrons as Inter Library Loan. It provides New Hampshire with a “virtual state wide library” allowing borrowers at smaller libraries with smaller collections and budgets access to the same materials that are available in larger towns, and provides everyone access to a larger collection of material. Removing three of the vans would only leave one van to support the entire state, effectively killing the ILL program. The vans are funded directly by a Federal grant, and not by state tax revenues. The average cost to move a book/video/cd, etc. is about 44 cents. The average cost to purchase that item is about $20.00. This savings means a significant reduction in the cost to New Hampshire taxpayers for their library service. In order to have access to the same materials, taxpayers would pay substantially more in the absence of this program. This is a highly efficient use of resources, with an enormous payback. The ILL program is one of the most widely used services in our libraries. More than 800,000 items are transferred annually. It is popular with students who require reference and research materials to complete school assignments; with seniors who do not have the resources to purchase materials that may not be available at their library, and to patrons who have specific interests that may not be supported at their local library. Our own Jennie D. Blake School borrows many materials through the ILL system, saving hundreds of local taxpayer dollars. This is Federal Funding that was targeted specifically at improving library services. It is the judgment of the state library that these ILL vans represent the best use of these funds. Our library staff and our Board of Trustees support this judgment, and so do the patrons who have signed this petition. We need to have a lot of voices in order to ensure that we are heard and that this valuable, efficient service be preserved! Please stop in at the Hill Public Library and sign our petition today. The HPL Board of Trustees will be meeting on Thursday, August 28 at 6:30 PM, in the library. All are welcome to attend. The library’s summer program, “One World, Many Stories”, is under way, and it’s been quite an expedition. 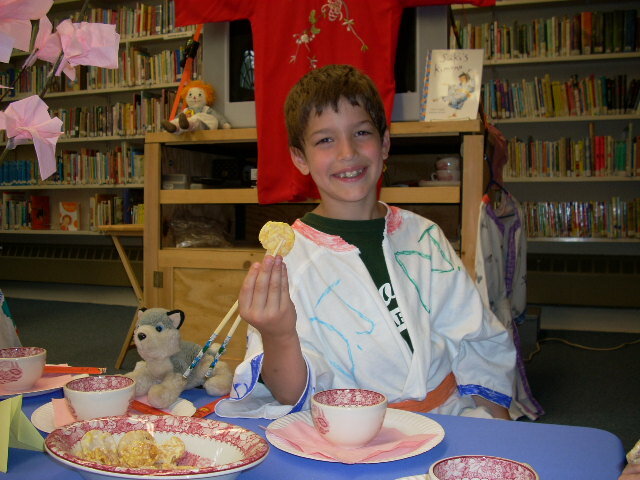 In just the past few weeks, the kids have learned to count in Swahili while on safari in Africa, mastered the use of chopsticks during a Chinese New Year festival, and picked up beautiful kimonos in Japan so we could attend a traditional tea party. And, that’s only a brief summary of our journey so far! Summer is not over. Neither is our adventure. There’s still Italy, Australia, France, Mexico,….and we’re planning to explore our own backyard while there’s still time. Phew! It’s not too late if you’d like to come along. Our “itinerary” can be found on the Programs/Events page.